What are the main characteristics associated with bite wounds? Why is an infection so problematic? What are the odds of contracting an infection after a bite wound? It is safe to assume that everyone can relate to a dog or cat bite injury. But a human bite injury – is there such thing? What type of germs can usually be identified in connection with similar bite injuries? When faced with a cat bite injury there typically are two damaging influences: The actual damage incurred through the force transmission of the bite itself, which may lead to injuries to the tendons, joints, or even bones (the latter applies more to dog bites though) and, secondly, severe infections as a subsequent result of the bite wound. The germs which thrive in the oral cavity of a cat are particularly aggressive. If these bacteria penetrate a wound they will most likely find perfectly suitable breeding grounds (blood and tissue). The proliferation of these bacteria in a wound will then take place at a very fast pace causing suppuration. This is particularly true if the external wound is considerably smaller than the sub-cutaneous damage, as this often leads to an obstructed drainage of pus and consequently to an unwanted accumulation of suppuration. This is how an infection following a cat bite may dangerously spread out within days, sometimes even hours underneath the skin. As a rule of thumb a dog bite injury carries a twenty-five percent risk of infection. A cat bite injury bears a fifty percent risk and a human bite injury lays even higher than that. At first blush speaking of a human bite injury appears odd. There certainly may be isolated cases of nursing staff members who were injured by demented or psychiatric patients. Most human bite injuries, however, are the result of brawls, when a fist punch hits the teeth of an adversary. Many times this will lead to fairly small injuries to the hand of the aggressor. The entering germs stemming from the oral cavity of the victim may lead to very severe infections that may include considerable damages to the thumb. Severe infection to a metacarpophalangeal joint of a hand after throwing a punch against the tooth of another human being. The image shows a severe joint infection incurred by a hand that hit a tooth of an opponent. 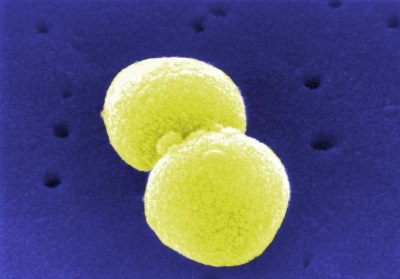 Bite injuries caused by human beings typically involve Group A streptococci germs. These germs are known to particularly quickly spread out and cause severe infections to hand and forearm, which in unfavorable situations may even end lethally. Dog and cat bite injuries to a human hand my cause infections due to the variety of germs flourishing in the animal´s saliva. Not in all cases can these germs be detected. However, in many cases Nocardia germs can be evidenced.